Samsung did have succeeded in producing electronics products according to the wish of millions of customers. The company which knows the pulse of the consumer has come up with a wide range of products mostly selling like hot cakes. From the Galaxy series of phones, the Galaxy Y a budget android device is making waves among the young generation of India. The 'Y' stands for 'Young', makes clear how the company has managed to produce a device keeping the young dynamic mobile users in mind. The reason behind the huge popularity of Galaxy Y will be the unique design, features and specifications which has left its competitors far behind. Samsung Galaxy Y S5360 is available for online buy from various shopping websites like adexmart, flipkart, indiaplaza, infobeam, saholic etc. 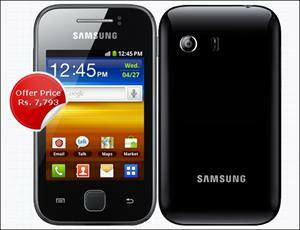 It is also seen that letsbuy.com, a trusted Samsung sales partner is offering Galaxy Y (Metallic Grey) online buy at Rs.7793. Meanwhile the website also offers the phone at Rs. 7,490 accompanied by branded accessories worth Rs.1200. If you wish to buy a new Galaxy Y phone do check the online links. The Samsung Galaxy Y is designed is such a manner to attract customers who look forward to choose a handset with no compromise in specifications, features and price. The Galaxy Y is powered by a 832 MHz processor which runs on Android 2.3 (Gingerbread) OS. Looking in to the minds of millions of youngsters, the Galaxy Y is power packed with a bunch of applications, much faster downloads, Wi-Fi and much more making it a real platform for mobile internet users. The big 7.62cm display and larger QWERTY keyboard will help users work even while traveling. As seen in the other galaxy phones the bottom of the Galaxy Y do have 4 fixed icons; Phone, Contacts, Messaging and Applications/Home. Apart from the various default apps like Camera, Clock, Memo, Market, Music etc few other applications like FM Radio, Social Hub, Youtube, Task Manager, Voice Recorder, Downloads section, Places, Latitude are also included. Quickoffice an app for editing and viewing Microsoft office files is also included in the phone. With the power control widget placed on the home screen, the setting of Wi-Fi, Bluetooth and GPS can be changed. By connecting to the web, you are going to enjoy real entertainment in just a click. The social hub which integrates texts and emails can give you instant access to your friends' mails and messages. The Samsung Apps (Free and Paid), the hub of apps will give you the best to choose from thousands of applications. The Galaxy Y has a 2 MP camera which brings down the hearts of those interested to zoom towards real situations. Especially the photos taken under low light might hearten a lot. The battery backup of the phone is appreciable as on single full charge 12 -17 hours is guaranteed. But if Wi-Fi, data network and GPS are all turned off, we can expect around 30+ hours of battery life on a single charge. Finally, the Samsung Galaxy Y is some thing special for a customer who is looking for a budget android phone. Looking at the specifications features and users review, the Samsung Galaxy Y will be a decent buy at price below Rs 8000. Even though there a quite a number of competitors on line for Galaxy Y, without any doubt this can be the best buy at limited budget. I think the Galaxy Y is expensive.